As the outer crust cooled, any pent up force within the planet would have most likely expressed itself by blowing out through the axial (polar) points and would have formed openings. (Our planet has polar openings) This seems to be what is indicated by the huge, crater-like depressions at the tops of the planets which we can observe. The outer rim or collar of such openings could be a tell-tale sign of such an outburst from the interior which happened long, long ago during the formative stages. 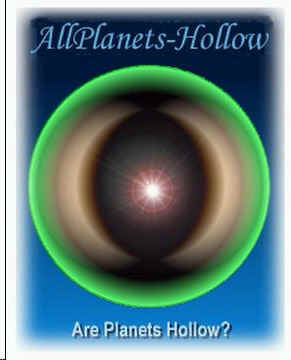 What hollow earth proponents are saying is that the same force which sculpted the outer shape of the planets, that centrifugal force, would have had to have opened up a cavity within the planets, too. The force could not have had such a dramatic impact on the exterior shape and curve of the planets, with no cavity opening up at the core. Because the centrigfugal force was not evenly distributed, the interior cavity would have the shape of a football or rugby ball, with the points edging towards the poles. And it can't be full of molten lava because the Earth has a magnetic field. The magnetic fields touch the poles and the Earth serves as a conductor to close the circuit. If the inner core of the Earth had the temperatures which the Molten Core Theory stipulates that it does, then any magnetic properties would be lost as heat destroys magnetism. And it doesn't take too much heat- this point is called the Curie Point. So the existence of the Earth's magnetic field indicates that the core is not molten nor hot.